– The produce of man's labour – particularly the profits of mills and fishing. Great tithes – from corn, other grains, hay and wood – commonly payable to the rector of a parish – were also called 'rectorial tithes'. Rectors were often remote from the parishes, so a new deputy or vicar was appointed to act as the parish priest. Because the vicar was not entitled to the great tithe, it was usual to provide him with the small tithes – worth about a third of the total tithe of the parish – as a basis for a living. A rector (or vicar) could also hold an incumbency elsewhere in addition to his main parish. In the early 19th century the holding of multiple incumbencies became very common and was known as 'Plurality' and it was a system that was often abused. In a case of plurality the incumbent would receive his stipend and tithes for his principal parish and the appropriate tithes for his secondary incumbency. From the tithes arising out of the secondary income he would pay a curate to look after that parish. Chudleigh has had a vicarage house since very early times and more recently we have two examples of plurality with Rev Burrington who was vicar of Chudleigh (1785–1844) and rector of Woodleigh and Rev Palk who was rector of Ashcombe and vicar of Chudleigh (1844–1885). From an early date the Manor of Chudleigh was held by the See of Exeter with the bishop in overall charge. In the year 1225 it is recorded that Bishop Brewer granted the advowson to the Precentor of Exeter Cathedral. The advowson being the right of the patron (in this case the Precentor) to present a candidate to the Bishop for institution and induction to the living. It would seem reasonable to assume the church, vicarage and glebe land were all located close together and all established at or about the 1225 date. Under the influence of the Precentors, the original church, which consisted of a nave and chancel, was replaced by a more impressive cruciform building. It was probably this church that was dedicated by Bishop Bronescombe on 6th November 1259. Our list of vicars commenced in the year 1303 and right up until 1546 the successive Precentors retained the right of presentation as the livings became vacant, usually due to death or where the incumbent decided to move elsewhere. As regards the former we know for example that in 1348 Chudleigh lost its vicar due to the Black Death. In 1546 the advowson along with the manor was confiscated by the Crown and remained in secular ownership from that time. It seems reasonable to assume that the vicarage house has always been located just to the east of the church (where Glebe House is today) although the house seen today will have passed through many reincarnations over the centuries and bear no resemblance to the dwellings that stood there formerly. But as we show in the following sections, the Vicarage has been in other palces, before and since. The first incumbent to be presented to the living after 1546 was Rev Benedict Wolcombe in 1571 whose patron was Christina Chudleigh, the widow of Sir George Chudleigh of Place Barton in the parish of Ashton. The Wolcombe family seem to have been incomers to the parish in the early 1500s but from where has not been established. The family is known to have been associated with the site of the old bishop's palace which was said to have been in a bad state of repair in 1523. In 1546 those premises were leased from the Bishop of Exeter to Edward Seymour, 1st Duke of Somerset; he held the lease for only four years at which point the whole was sold to Sir Piers Courtenay of Ugbrooke, passing later to the Cliffords. In 1597 it is recorded that Rev Benedict Wolcombe was occupying fourteen acres of land in the vicinity of the old palace that was referred to as Wolcombe's Knoll. Was this just land or was there a dwelling there too that he used as the vicarage house? There is some evidence pointing to a dwelling at the old palace site. On 28 April 1597 much of what originally comprised the Manor of Chudleigh passed back into local hands. The following is of relevance as it suggests that there was still a 'mansion house' located at the site of the old palace – was this mansion that became the vicarage? '...The Lawns situate near the West End of the Town and adjoining to the water leate leading into the said town of Chudleigh on the North East side and the highway leading from the town to Hightley on the N.W. side, and the lane leading to the Mansion house called the Place...'. In May 1597 Thomas Bridges Esq of Tangley, Oxfordshire sold to John Bennett the lease of Whiteway and Wolcombe Knoll. A document of 1656 (two years after Rev Robert Wolcombe snr death) is entitled 'Robert Wolcombe, clerk. v. John Bennett: Vicarage of Chudleigh, in the county of Devon. Tithes. : Devon'. Was this former John Bennett the same as in the later 1656 document? We know now that Wolcombe's Knoll was at the old palace site. The Robert Wolcombe mentioned would have been the dissenter, previously of Moretonhampstead who died at Chudleigh in 1692. The earliest reference found specifically naming a vicarage house was in the year 1601. The parish carried out a survey of the pot water course from the head weir (Oxencombe) to the vicarage. This is interesting as in that year Rev Robert Wolcombe had just taken the incumbency following the death of his father Benedict and as stated above, the Wolcombe family were associated with the old palace site. It is also certain that in its earliest form the pot water was a channel that led directly to the palace. Another connection here is that William Putt (likely a yeoman) was, in 1601, living at Place (another name for the old palace). His daughter Philippa had, in about 1590 married Rev Robert Wolcombe. There is another school of thought that the vicarage location at this time was on the site much later occupied by the house now called Swanston House, immediately north of the church over Vicarage Lane, but there is little hard evidence supporting this site. In 1621 there was an inquiry into the use of the pot water and it was agreed by the committee that it should be allowed free to what was by then referred to as the Old Place. If a supply was directed there it would suggest there was someone there making use of it, which might also imply a dwelling of some sort. If it was the vicarage then that might explain why the supply was free. (Payments for use of the water were made to the churchwardens at that time). We know that the pot water ran into large fishponds situated in the fields (called the Palace Meadows) just to the north of what is now Palace Farm, a building that dates to the late 1600s (Grade II listed). This farm appears to have previously been called Place Barton (a barton being an alternative name for a farm). In 1654/55 the parish was without a settled minister and in 1656 a non-conformist by the name of Mr Byfield appears to have held the position for no more than about two years. It is not known whether he had the benefit of living in a vicarage house. By this time the Clifford family held the old palace site and as they were then (as now) Catholic, it is quite possible that this Mr Byfield lived in a dwelling at the old palace. In the parish accounts of 1658 on the induction of Rev Stephen Bloy there is reference to 'the vicaridge and premises thereto belonging' being provided to him, but there was no description to show where it was located. The Lambeth Palace Library has a document with Stephen Bloy named under date 15 March 1659 that mentions the vicarage. It is likely that at his induction the parish provided a new house for him that was probably located east of the church. Land in this area was for many years glebe, i.e. land owned by the church. The Clergy Residences Repair Act was passed in 1776 that was 'An Act to promote the residence of the Parochial Clergy by making Provision for the more speedy and effectual building, rebuilding, repairing or purchasing Houses and other necessary Buildings and tenements for the use of their Benefices.' This may point to a new construction/rebuild date of the vicarage that much later evolved into The Glebe House. In 1776 from the details of the Poor Rate we have 'Mr James Yeo for Northwood, fairs and markets and Vicarage' but again its actual location was not mentioned but was likely on the site of what is The Glebe House today. As for the site of the vicarage house there is a small clue as to its location when mentioned by Rev John Swete when he passed through Chudleigh on one of his tours (1794); on travelling up from the River Teign, he described the vicarage as being to the east of the church, which would seem to be more or less the site of the Glebe House today. 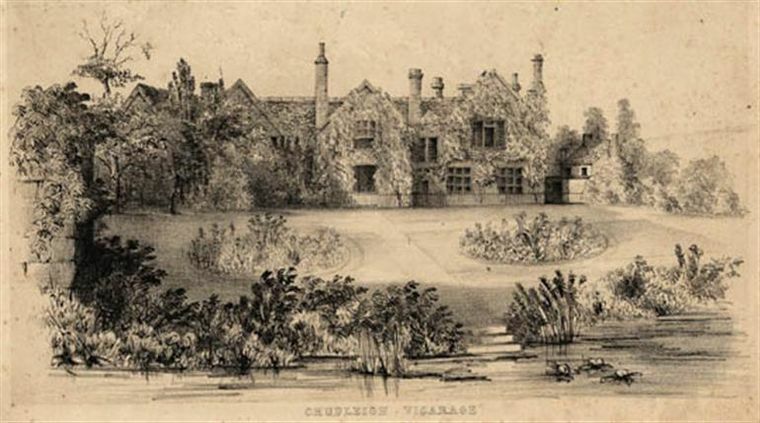 An engraving exists of the vicarage house dating to 1840 which shows a house much wider than it is today with what appear to be four bays and at least six chimneys. A sloping formal garden with a central path is shown leading down to what appears to be a pond, or perhaps the Kate Brook where there are three steps to the waters edge. Another interesting feature of the engraving is that at the left is a part of a stone wall, could this be a remaining part of the old Bishop's Palace? There also seem to be two stone arches near the left end of the building. Although the engraving is c1840 it could well be based on an older illustration. This building seems not to have evolved into Palace Farm as that was built in the 1690s so was already over 100 years old if this engraving is based on an illustration of the early 1800s. Looking closely at the 1838 tithe map, the dwelling depicted in the engraving may have stood on what is the current Glebe House site and not on the old palace site. From the Tithe Apportionment list compiled in 1838 we know that the acreage of the glebe lands were 1 acre 0 roods 16 poles. It was in the occupation (and ownership, as vicar) of the Rev Gilbert Burrington. The land referred to as glebe was the area of land that belonged to the living (benefice). This was property (in addition to the vicarage house and grounds) which was assigned to support the incumbent. The incumbent was entitled to retain the glebe for his own use if he wished, as in the instance of Rev Gilbert Burrington and some incumbents would let it out, and any income would then form part of the stipend. A further Act of Parliament, The Parsonages Act was passed in 1838 that permitted an incumbent to sell his parsonage house; the purchase money was to be paid to the Governors of Queen Anne's Bounty who would use it to erect or purchase a new parsonage. Although not resident in Chudleigh, Rev Wilmot Henry Palk (vicar 1843–1885) improved the vicarage according to Mary Jones (1875), who said 'The vicarage house has been rebuilt by the present vicar, and is situated east of the church.' Rev Palk resided at Ashcombe Rectory whilst a succession of curates lived at the vicarage in Chudleigh. The Glebe House of today is of two bays with a chimney at each end and viewed from the south the new extension is to the left side. From the Mid Devon Advertiser we know that the two-storey extension to the building was made in 1886, creating a ground floor room for use by the Sunday school and on the upper floor two bedrooms. The house, a private residence today – sold by the Church Commissioners in 1948 – may well retain some early work but is essentially of the Victorian period. 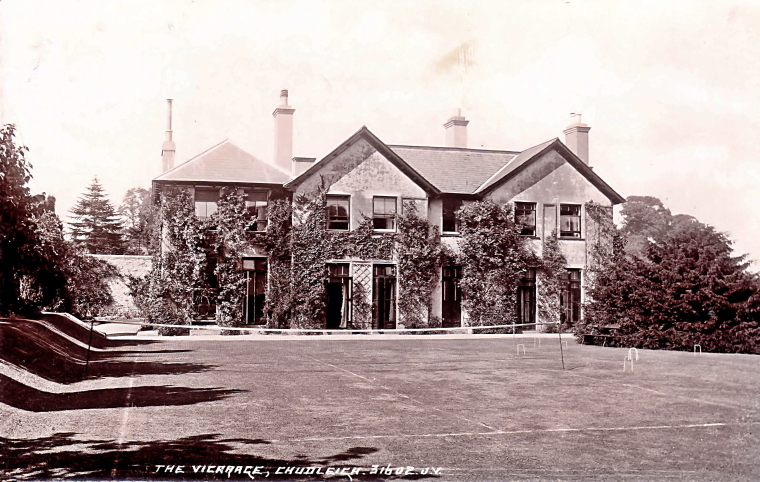 1906 postcard view of the Vicarage House. Tennis or croquet today, Cynthia? On its sale in 1948 the vicarage was renamed The Glebe House. The purchaser was Major-General C B Robertson CB CBE MC and his wife. Following the sale of the vicarage house the Church Commissioners then took a fifteen year lease on the east part of Culver House (New Exeter Street) which was retained until 1957. During this period the church fetes were held in the grounds of The Old House, next door to the church on Fore Street. The land still owned by the church to the rear of the vicarage was sold off and in 1997 and developed as a cul-de-sac of 30 houses. The name for that development was appropriately chosen as Glebelands. The next house acquired by the Commissioners for use as the new vicarage was called Collingwood (dating from 1905/06) that stood on the west side of the Parade. It was built for Mr Robert Collings, hence its name. That house still serves as the vicarage and is only one of two in the town to be constructed of dressed limestone, the other being Gordon Lodge in Station Hill. The vicarage House (Glebe House today) was regularly used for meetings, Sunday School, etc. and for fêtes in the grounds. When further meeting space became necessary a separate building was erected nearby in Parkway Road and called the Vicarage Room. That building served many useful purposes down the years, particualrly in the early years of World War Two when it acted as schoolroom for evacuee children relocated to Chudleigh from London. The building was demolished in early 1981 and its site used for the building of four houses called Parkway Mews. On 6 November 1259 Bishop of Exeter Walter Bronescombe dedicated the church to St Martin and St Mary. It is reasonable to assume that it was about this same date that the boundaries of the parish of Chudleigh as we know them today would have been created. (Parish boundaries within the city walls of Exeter were drawn up in 1222). Records are silent as to the names of our vicars for the first forty-four years of our parish church. 1839 No Vicar until 1843. The vacant position was covered by curate Joseph Cuming who in addition was master of Chudleigh Grammar School.